What is the future of the Democratic Party? They have essentially lost the core building block that FDR fashioned - "blue collar workers" and their families. Blue collar is inclusive of the non-college graduates. The Dems have also lost almost all of the small business people who used to be a part of the party. If the party turns more "progressive," it will play into the hands of the Republicans in 2018. In 2018, probably moreso than 2016, "It's about the economy stupid." As it stands I forsee at least 65 GOP senators and 250 (probably more) GOP members of House-218 controls the House. they should go with howard dean as opposed to either donna brazile or keith elllison. You're right, the Dems would seem to have lost (I would say, abandoned) their working class base. But, is the answer to keep moving ever farther to the right? When offered the choice of a genuine or a faux Republican, they'll vote for the real thing every time. I don't see the Dems regaining power anytime soon if this right/centrist trend continues. They started losing their way when they sold their soul to win the presidency in 1992, after having lost with weak candidates like Mondale and Dukakis. So what do you suggest? Any ideas of where they should go? What approach should be used? I know you're not a professional political strategist or anything; none of us are. But I've read a lot of blaming (I don't mean you, I mean in the general sense) and a lot of Monday-morning quarterbacking, but not many real suggestions for a path forward other than "throw the bums out!" Or are the Dems going the way of the Federalists and the Whigs? I don't know the players but did Bernie suggest Keith Ellison for the DNC? We're all grasping at straws right now. I do believe if the Dems continue to ignore their traditional base they will become ever more irrelevant. The Dems were gloating about what they predicted would be the destruction of the Republican party if Trump got the nomination, but it seems they are the ones facing extinction. Throwing the bums out, as you so aptly put it, would be a good place to start. Yes, he did, Bogie. I would prefer he remain in Congress, though. Former Ohio St. Senator Nina Turner is my preference. Correction: I should have said "I would prefer he remained focused on serving in Congress..." As we have seen by the example of DWS, it's possible to do both, but I would say each job deserves full time attention. He's right, Hillary didn't work as hard. Much was made, especially by JakeHolman, about how much time she took off during the campaign. Over-confidence and who-know's-what medical issues (the admitted pneumonia, possibly more?) made her lazy and not nearly involved enough. And her inner circle spent more time trying to keep up with each new scandal than they did getting the candidate out and on message. And I don't discount the Trump media effect. Hillary did, in fact, talk substantive issues on occasion, but why would the media spend time on "boring" economic talk when Trump's busy "grabbing *****" and insulting Rosie O'Donnell. You know, the important stuff. Disregarding the fact that they used an unnamed (probably out of fear of retribution) source, this piece gives a fascinating insider look at the events of election night. and I hear he's already got a gig. My advise to the Dem party would be to make slight concession on some of the major issues: E.g. supporting a ban on late term abortion, supporting enforcement of existing immigration laws, allowing a business to deny services based on religion ground as long as doing so causes no economic harm, minimum wage increase of only $12 and instead of annual inflation adjusted increases a more delayed increase mechanism and agreeing to cuts in spending on social programs \ entitlements. As for JOBS, which I believe was a major reason Trump won those battleground states Trump was just blowing smoke as it relates to him improving the economy but clearly more voters agree with his BS over the silence of Clinton. As I said I don't think the Feds can do much in this area. If that is that case and a Trump admin isn't able to reduce the trade deficit with China much, the overall number of jobs being outsources, or increase wages, the Dems just have to wait and campaign on that. Apparently there is conflict among the House Democrats as to how leadership positions are filled. The top three people are all over 75 and do not represent the "Heartland." The ranking Democrat on each committee is also very old. Pelosi is probably secure because of her ability to gain concessions from GOPers, even if they don't realize it, and ability to raise money. The Republicans have much younger people in leadership positions and also have term limits on many of them. Most Democrats come from the West Coast and Northeast. Some come from Southern and other states where their districts are gerrymandered for them-placing Democrats and minorities into one district per state. Means they are assured of winning re-election without really having to try too hard. Jim Clyburn (76) of S.C. for example. So, what are they going to do to create a new wave of younger Democrats who will get national attention and interviews on all the news programs? What are they going to do to increase the number of Democrats in the Heartland and make them nationally successful? What are they going to do to promote younger Dem Reps. so they can successfully run for senate seats? 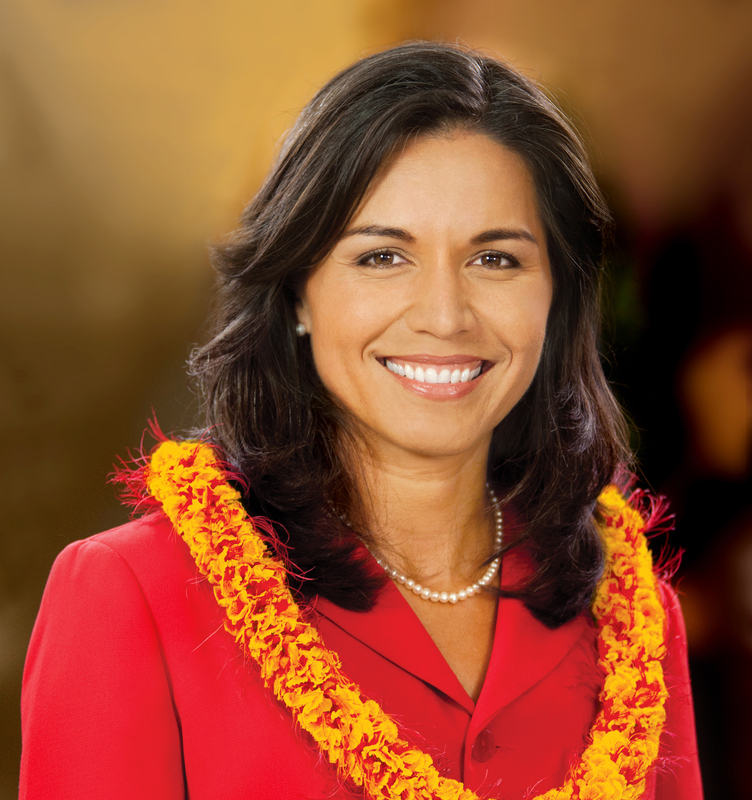 Tulsi Gabbard, the next and first woman to be POTUS. Who is this woman? I've seen her mentioned on here a few times, but haven't seen her elsewhere. I guess I could research her myself, but where's the fun in that? Congresswoman for Hawaii and Bernie Sanders supporter. I don't see Trump coming anywhere near close to her in any sense. Nvm...I just read up on her. The fact that she was born in American Somoa and is a practicing Hindu should endear her to the Heartland. Will a country that just elected someone like Donald Trump be ready to elect a woman that wasn't born in the 50 states and isn't a Christian? I agree with her stances on every issue that I just read, and I'd vote for her, but would a majority of Americans? Doubtful. Maybe not president for reasons Lawrence noted, but she appears to be what Dems. need as a leader in the House and eventually a senator. Times may have changed, but 2008 saw the election of a black man whose middle name is Hussein, so anything is possible. Besides being a vet, she also demonstrated integrity by dropping out of her DNC office to commit to endorsing Bernie. That should work in her favor. I'd like to think that by the time she'd be ready to run, the circumstances would be favorable. Counting my chickens? Perhaps you mistake me for a Trump supporter, Hibi. I'd like to think that America would be ready, too. But they just elected Donald Trump. So that pendulum is gonna need to swing reeaaally far in the other direction for that to happen. You might want to rephrase that last sentence. Bella doesn't sound like a Trump supporter at all and never has. For you to say she sounds like one is poor reflection on you and not her.